Over the past 12 years Women’s Health Action have produced breastfeeding posters we currently have two A3 sized posters in stock. Tumeke: A beautiful A3 sized poster of a painting by Māori artist Theresa Reihana. Produced by Women’s Health Action in partnership with Te Oranga Te Rarawa. 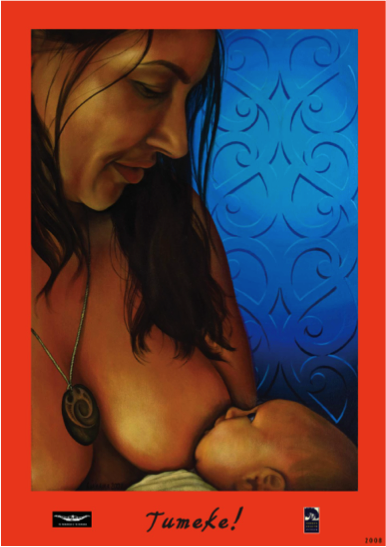 Outstandingly Healthy: A vibrant A3 sized promoting continuation of breastfeeding after introduction of solids. The poster also provides factual information about the energy input of breastmilk for children from 0 – 2 years. Stickers with the international symbol for breastfeeding in Te reo Māori and English. Breastfeeding and working for employers: A pack providing key information for employers seeking to provide a breastfeeding friendly workplace. Breastfeeding and working for employees: A pack providing key information on returning to work and breastfeeding.